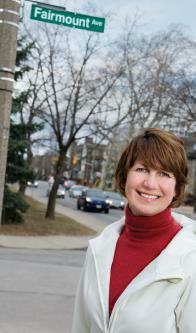 Heidi grew up in Hamilton but has lived in Waterloo for the last twenty-five years. Through her recently-established private foundation, called the Fairmount Foundation, she has joined forces with HCF to research the best ways to make post-secondary education opportunities available to all Hamiltonians. Both HCF and Heidi believe that education will be the “game-changer” in Hamilton’s future. The Fairmount Foundation is partnering with HCF on in-depth research that is examining which models and approaches are most effective at helping youth to reach their full potential. The results will define strategies for both foundations to help youth and adults succeed in high school and beyond. “I’m fortunate that I can be involved in this innovative groundwork with HCF,” she says about her commitment to the partnership. The Fairmount Foundation is just two years old, and Heidi is feeling her way in the new venture. The connection to Hamilton Community Foundation’s staff and process has been a boon. In the years ahead, the two foundations expect to involve others in the collaboration. The partnership has also cemented Heidi’s enduring ties to our area. “The Fairmount Foundation is named for the street I grew up on in Hamilton,” she says. “And as I work through its priorities and goals, I realize that they reflect my Hamilton roots, my family, the values my parents taught us about respect and fairness.” Her siblings still live here, as do many of her friends.